A New York appellate court recently published an opinion discussing the application of youthful offender status. The facts of the case are as follows. The juvenile was 18 years old when he was involved in an incident in which he stabbed a woman repeatedly and cut a bystander. The juvenile was indicted on charges of second-degree attempted murder, first-degree assault, and second-degree assault. He then pled guilty in exchange for a promise that his prison sentence would be capped at 20 years in addition to post-release supervision. In the defense counsel’s sentencing memorandum, counsel requested that the court treat the defendant as a youthful offender. The counselor also asked that any statements provided by the victims or their family members be disclosed with the pre-sentencing investigation report. During the hearing on sentencing, defense counsel objected that he did not receive any victim impact letters with the report. The court denied counsel’s request to receive the statements. Oral impact statements were presented from the victim, the victim’s parents, and an intervening bystander injured during the incident. After the statements, the court remarked on the horrific nature of the crime and the life-long impact that the incident had on the victims and their families. The court made no mention of youthful offender status and imposed an aggregate sentence of 20 years’ prison time and five years’ supervision following release. The defendant appealed, and the Appellate Division reversed the decision, remitting the matter to the sentencing court to make a determination based on the record regarding whether the defendant should receive youthful offender status. The Appellate Division had determined that the lower court reviewed witness statements that were not released to the defendant or included in the record, so the reviewing court asked for a list of the statements that were reviewed and a statement of reasons regarding why the statements were not released. According to the sentencing court, the Probation Department provided certain documents to the court based on a promise of confidentiality, leading the court to prevent their disclosure. In yet another victory in a New York firearms case, a Tilem & Associates client arrested in New York’s LaGuardia airport in September with an alleged “high capacity” magazine had all felony charges dismissed and only pled guilty to a non-criminal disorderly conduct, a violation but not a crime under the New York State Penal Law and paid a $250 fine. The record will be sealed. New York State bans the possession of what it calls a “Large Capacity Ammunition Feeding Device.” NY Penal 265.00 (23). A Large Capacity Magazine Feeding Device is defined as “a magazine, belt, drum, feed strip, or similar device, that (a) has a capacity of, or that can be readily restored or converted to accept, more than ten rounds of ammunition, or (b) contains more than seven rounds of ammunition, or (c) is obtained after the effective date of the chapter of the laws of two thousand thirteen which amended this subdivision and has a capacity of, or that can be readily restored or converted to accept, more than seven rounds of ammunition . . .” Boiled down, and there are some exceptions, New York defines both a capacity limit and a load limit. Under New York Law, as written, one could either not possess a magazine with a CAPACITY of more than 10 rounds but if one had an old magazine with a ten round capacity one could only LOAD up to seven rounds into that magazine. An empty magazine with a capacity of more than 10 rounds is a class “D” violent felony under New York Law punishable by up to seven years in prison. In the Federal case of NEW YORK STATE RIFLE AND PISTOL ASSOCIATION INC LLC v. Gerald J. Gill, the United States Court of Appeals struck down the seven round load limit finding it violated the Second Amendment but left the 10 round magazine capacity limit in place. New York has banned the possession of stun guns by listing them as “per se” weapons in the Penal Law. Possession by a civilian even in a person’s home constitutes Criminal Possession of a Weapon in the Fourth Degree, a class “A” misdemeanor, punishable by up to one year in jail. 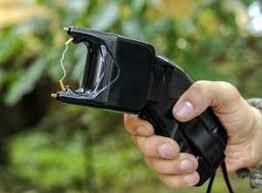 There is no license available for civilians to be able to possess stun guns. Rather New York, like Massachusetts and New Jersey have a total ban on civilian possession of stun guns. However, last month, in the first Second Amendment case decided by the Supreme Court in years and in a stunning rebuke of the Supreme Judicial Court of Massachusetts, the United States Supreme Court struck down Massachusetts’ total ban on stun guns and found that stun guns, like any “bearable arms” are subject to the protections of the Second Amendment. In Heller, in 2008 the United States Supreme Court ruled that the Second Amendment “extends, prima facie, to all instruments that constitute bearable arms, even those that were not in existence at the time of the founding.” Bearable arms, is a very broad term that encompasses much more than firearms which are the usual focus of Second Amendment jurisprudence thanks in large part to the National Rifle Association and other similar groups. As a result of the focus on firearms very little has been written about other “bearable arms.” Two years later in McDonald, the Supreme Court ruled that the Second Amendment is fully applicable to the States. In the case of CAETANO v. MASSACHUSETTS, decided last month by the US Supreme Court, the Court criticized the Supreme Judicial Court of Massachusetts’ analysis of the Massachusetts stun gun ban. The Massachusetts high court offered three explanations for why stun guns were not protected by the Second Amendment and the US high court rebuked them for each one explaining that each reason given was inconsistent with the Heller decision. First, the Massachusetts Court tried to explain that Stun Guns were not in general use at the time of ratification of the Second Amendment despite the fact that Heller specifically rejected that argument in 2008. Next the Massachusetts Court argued that Stun Guns were not adaptable for military use another argument specifically rejected in Heller. Lastly, the Massachusetts Court suggested that Stun Guns were an unusual weapon an argument that the Supreme Court equated with the first argument that they were not around during the time of ratification of the Second Amendment.